The perfect dessert for a hot summer’s day! Toraya is one of the traditional Japanese sweets shops most representative of Kyoto, and the history of the shop dates back around 500 years. 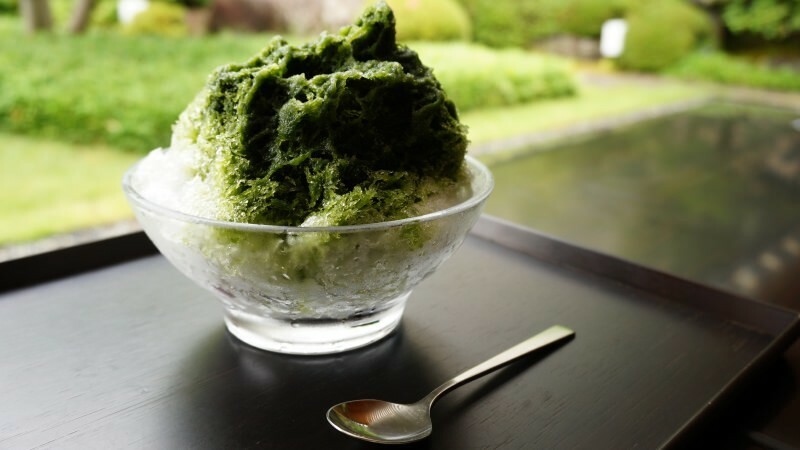 Their classic summer kakigori, Uji Kintoki, is topped with a lot of matcha syrup. When you eat the kakigori you will find some red bean paste with a gentle, not too sweet taste under the shaved ice; eating these two together will make the taste even better. You can have the kakigori while you look out at their beautiful garden, and enjoy the traditional taste while you rest your eyes on the garden. Kakigori is on sale here until the end of September. Nijo-Wakasaya has a history of over 100 years. 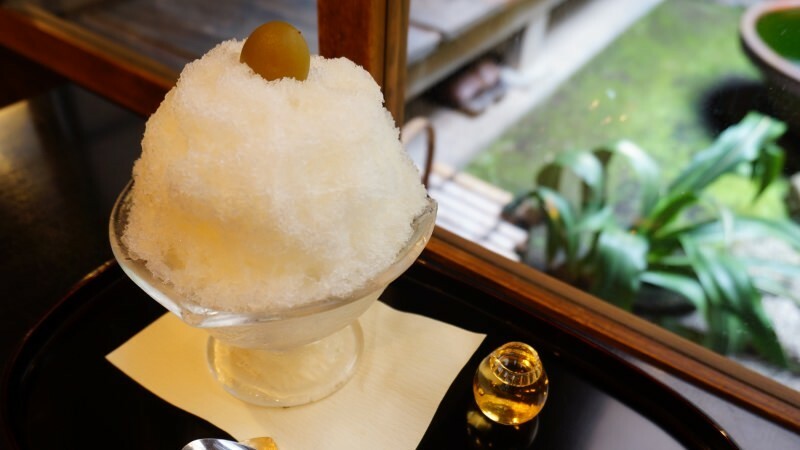 Their most famous item is the kakigori with five types of syrups to pour on it. The tastes of these five syrups change seasonally, and they have such syrups as bekkoame candy, kiwi, and brown sugar milk; they have something for everyone. You can enjoy the tastes one at a time or you can mix them. It is really fun to pour syrup on the kakigori yourself, and this will surely become a lasting memory for you. They sell kakigori all through the year. Tsujirihei has their shop located in a quiet suburban area in Uji, the home ground of matcha: for this reason their sweets have that rich, strong taste of matcha. The matcha kakigori at Tujirihei is made using very finely shaved ice, topped with matcha syrup, and inside it, you can find red bean paste. You also have more matcha syrup in a small glass by the kakigori, and you can pour this on the kakigori if you want an even stronger matcha taste. 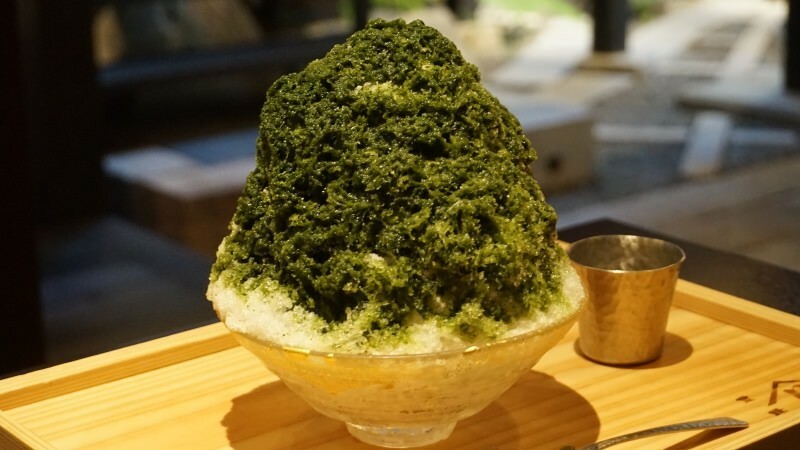 Besides matcha, you can also have hojicha or genmaicha kakigori. Kakigori is sold until the end of September. Bun no Sukechaya was founded in the Meiji period (1868-1912) and the place is famous for their amazake (a sweet drink made from fermented rice) and warabimochi. 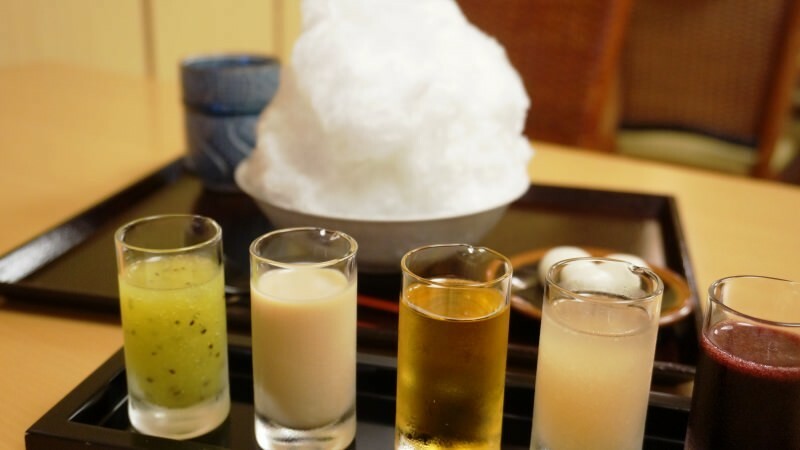 Their kakigori is called “Inakagori,” countryside ice, and it is topped with roasted soy bean flour syrup and ice cream, sticky rice balls, and it is a very popular product in summer. The roughly shaved ice mixes well with the roasted soy bean syrup. It may look sweet but it has a rather refreshing taste, and a strong taste of roasted soy bean flour; this kakigori is perfect for those who like roasted soy bean flour. The building still has that retro Meiji period feeling to it, and Yasaka Pagoda is also close, so you could hop in when sightseeing around the area. The kakigori is usually sold all through the year, unless there are extenuating circumstances. This sweets café with a historic feel, Seien, is on Rokkaku Street, and they are famous for their elegant desserts such as their “Kohaku Nagashi” agar dessert. During summer they sell kakigori, and my recommendation is this kakigori shaved ice topped with plum liquor syrup. This kakigori does not only look refreshing but besides the plum liquor syrup, it is also topped with a real plum soaked in plum liquor. The taste is an elegant one aimed at grown-ups. Kakigori is sold until the end of September. 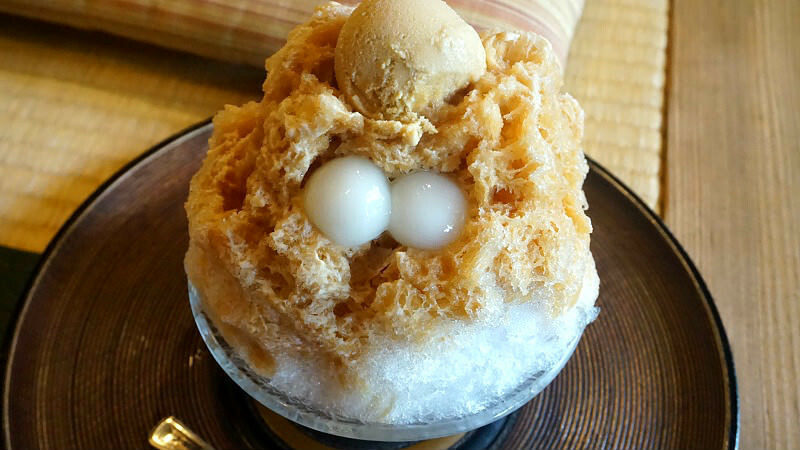 Here you have five sweets cafes famous from their kakigori. All of them are old and established, and the kakigori sweets they serve have been favored for a long time by the people of Kyoto, and I hope you will do likewise, and have a bowl of kakigori on a hot summer’s day. Part 2Popular and trendy kakigori in Kyoto! Part 4Cute parfaits you can have at new and trendy cafes!